When my elementary students walk into class they find their spots, close their eyes, place their thumb and pointer finger together, and breathe quietly for a few breaths together. This beginning routine gives me a chance to catch my breath, but it also gives the kids a chance to get ready and get centered for our time together. Those beginning moments are peaceful, but the best is when I see a student fall into that shape and breath without my instruction. I see it working, and I want to offer more. 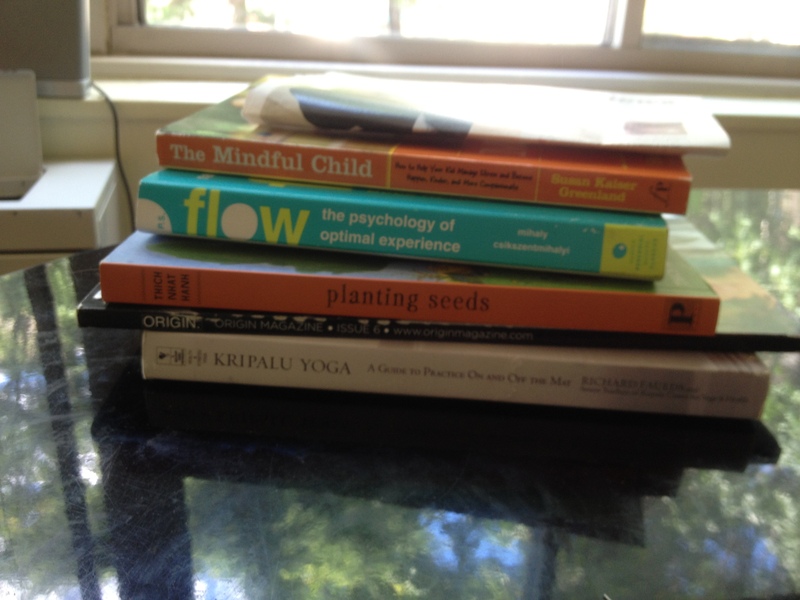 So I went on Amazon and gathered all I could, and have been on a major mindful kick lately. I have been devouring any and every resource about mindfulness. Being mindful is something that seems obvious, simple, and accessible, but how often throughout the day do we really focus on our breath and the thoughts in our mind? Mindfulness is being present – and with all the to do lists, replays of past events in our brains, and constant internal dialogues – it takes practice to know when and how to press the p a u s e b u t t o n & b r e a t h e.
I notice a big shift when I am able to slow down and bring my awareness to my breath – no matter what I am doing, my mind slows down, even if for only a moment. I become more clear, calm, and grounded. I have experienced the actual benefits of being mindful and I am thrilled to share these lessons of mindfulness to my students as they begin to navigate through life. More practical and age appropriate activities to come.